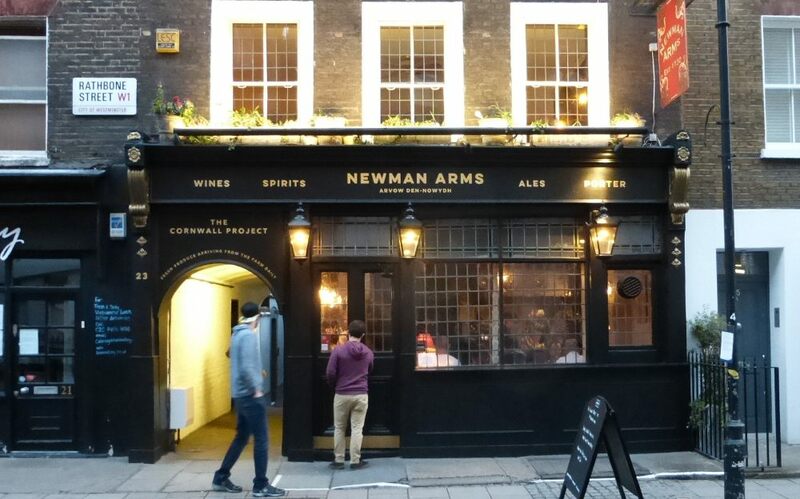 The Newman Arms, on the corner of Rathbone Street and Newman Passage, has a fascinating history, and it is just entering a new and exciting chapter. Serving you dreckly. The historic Newman Arms gets a Cornish update. Both Dylan Thomas and George Orwell drank there and the latter used the pub as the model for the “Proles Pub” in his 1949 masterpiece 1984. The atmospheric Dickensian Newman Passage has often been used as a setting for both television and film, such as in 1959’s grisly film “Peeping Tom”. For the past 20 years it was a popular local family-run pub, managed by Tracey Bird and her daughter Amber, and was famous for its upstairs “Pie Room” restaurant, in which a great variety of excellent pies were served as main courses. Tracey and Amber have moved on, having sold the Newman Arms last year to landowner Shaftesbury — which owns just under £3 billion’s worth of land in central London, £85 million of which is around Charlotte Street. 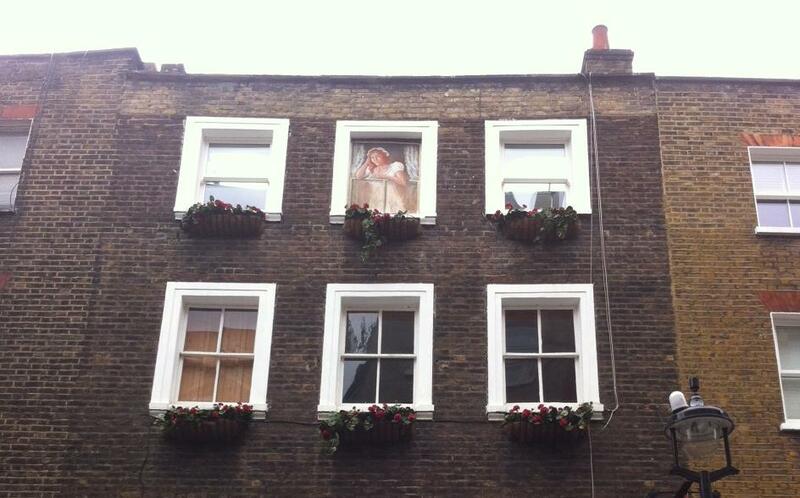 A painted lady on a bricked-over upstairs window above the Newman Arms. Photo: Clifford Slapper. We have been expectantly awaiting the arrival of new tenant, Matt Chatfield, who has exciting new plans for the Newman Arms, whilst keeping intact the essence of the old and much loved location. Matt has spent the last five years working closely with farms, fishermen and tradesmen in Cornwall to supply London restaurants with high quality fish and sea-food, as well as meat and vegetables, using select Cornish suppliers such as butchers Phillip Warren and fishmongers Matthew Stevens. This year sees his company The Cornwall Project take the next step by running its own outlets where such choice ingredients can be assembled and well cooked in one place, and the showcase for this will be the upstairs restaurant at the Newman Arms, opening this month. I met Matt late in May, at which point the downstairs bar of the pub had already re-opened and been running nicely for a month, broadly along the successful lines of recent years but with a few tweaks, including some rather special bar food such as, of course, the Cornish pasty. They are also selling Cornish beer, and it seems that the London branch of the Cornish nationalists are considering making the Newman Arms their base for putting on music and dancing. The restaurant boasts that it will have fish on your table never more than 24 hours after it left the water, the vegetables never more than 24 hours after they were in the ground. Matt is clearly fanatical about sourcing ever higher quality produce, but equally about doing good for both Cornwall’s reputation and its people as suppliers of this produce. Matt comes from a very old farming family in Launceston. He started driving a van back and forth between the butchers, fishmongers and growers in Cornwall and a handful of London’s top restaurants. He found the best way to ensure that quality improved despite increasing demand and scale, was by fostering close contact between chefs and suppliers. He sees The Cornwall Project as a co-operative or collective of perfectionist chefs from London and suppliers from Cornwall. The high unemployment rate in Cornwall matters to him as much as the high quality of the food he delivers, and he is pleased to have created nearly a hundred jobs there already through the project. Newman Arms, 23 Rathbone Street, Fitzrovia, London W1T 1NG.